Qualcomm அவர்களின் புதிய processors-களை launch செய்து உள்ளார்கள் அதை பற்றி இந்த video-வில் காணலாம். Qualcomm has released their new lineup of processors - the Snapdragon 655, 730 and 730G and all of them come with radically improved GPUs that should provide a much better gaming performance especially for phones in the 10k to 25k range! We have the world’s first gaming processor for smartphones in the newly released Snapdragon 730G from Qualcomm. It features multiple advancements like an overclocked Adreno 618 GPU as well as gaming elite features that had previously debuted with the flagship level Snapdragon 855! We also have the regular 730 that is also a good upgrade in terms of features and speed when compared to the 710 and 712, not to mention that they are both built on the 8nm manufacturing process as compared to the previous 7 series chipsets that were all made on the older 11nm FinFET process. The 665 is the least powerful chipset among these 3 but might be the one that we see the most of since it is a direct upgrade to the Snapdragon 660 that is being used in budget devices by multiple OEMs including Xiaomi, Asus, Realme and others. It offers upgraded Adreno 610 GPU and the ability to support a 48MP sensor natively so we might find it in future devices like the Redmi Note 8. Color OS 6 - புது Features!!! 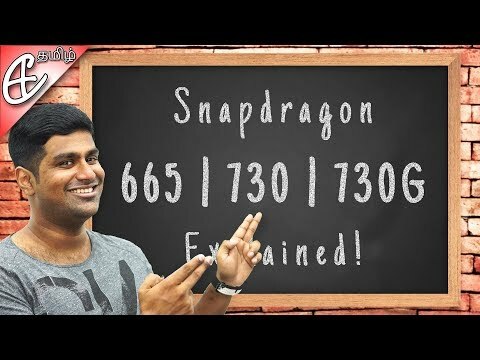 PRIME #77 : Whatsapp Stickers , OnePlus Gift , SnapDragon 675 , Pubg now ?